Do you feel the need of hiring an eCommerce development company for your business? 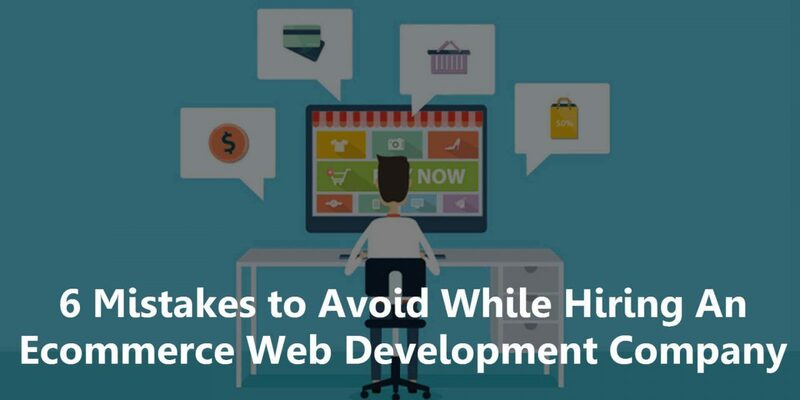 Do you know what common mistakes you might be making in hiring an e-commerce developer? If not, here’s what you should be knowing. It goes without saying that the utility of internet has increased manifold since the last decade. After all the presence of a business online has humongous benefits over the traditional mode of business. This is the reason, e-commerce is the term that we have all been hearing a lot these days. With an e-commerce business, you can always generate substantial profits and your web presence will turn out to be one of the most strategic assets that a business can own. A well laid and designed web solution must capture all the essential elements required for it to prove as an atypical web layout. You can either design the web essentials required by your business all by yourself or by hiring a professional eCommerce development company. These companies possess skills and expertise that are a must to tackle a web development project from the onset to its completion. The company you are going to hire might be working with the outdated technology. For example, any platform like Magento has been upgraded and if your development company is still working on its older versions. With technology evolving every day, this might turn out to be a hindrance to the smooth functioning of your web solutions. When you hire an eCommerce development company, make sure that they are well aware of the updated technology. Secondly, the company might not provide you with the right suggestion that could be apt for your web solution. This can be a result of the limited skills of the company professionals. The platform of your web solution will grow with your business. But, the e-commerce development company might not suggest you the right e-commerce platform which can only be determined after deeply considering the inventory size your business holds, projected amount of customers and even the payment methods. When you don’t have the right platform, you don’t offer your customers with a seamless and a smooth shopping experience which makes them reluctant towards your business. Did the developer you hired just say that he can deliver you an amazing web solution by taking it right to the coding part? If yes, RUN! A web solution requires an in-depth analysis of target audience of the business, without which it turns out to be a useless one. So while you are planning to hire an e-commerce development company, make sure you go for the one which does things systematically and considers your requirement. This can be one of the biggest mistakes you can get stuck with. Even though the development companies possess knowledge in app development and web solution layouts, they still need to have an apt and relevant experience in your niche so as to meet the demand of your business. A company with no experience in your niche can let your business down and affect your business drastically. To avoid this, make sure that you have dug a bit deep and with the market research, approached an effective and experienced e-commerce development company. Did you determine the company you’d be choosing for the creation of your web solution on the basis of the price they have quoted? You are highly mistaken then! Though as the business, you would want to save as much money as possible, but don’t you forget that low cost will come hand in hand with low quality. Be wise, and don’t focus much on the pricing. Consider the price of web solution as one of the general criteria and not a major determinant to choose the development company. The core aim of your business is to reach out to potential customers and for that you need an SEO optimized web solution. But what if the company you are planning to hire for the web solution of your business isn’t aware of technicalities of SEO. Well, in that case, just don’t hire them. After all, a company that cannot offer you an SEO optimized web solution, cannot help your potential customers reach out to your product. At Systematix, we make sure that none of the aforementioned mistakes take a toll on your business and we have the best of the expertise from the industry to offer you quality web development services. We use the best of eCommerce platforms that include Magento, Shopify, Prestashop, Zencart, Laravel, Angular, Oscommerce, Woocommerce, and Xcaret. We have Magento certified developers who assure that the web solutions offered by us are on point and perfect.